I am starting a new feature... won't be weekly, it will be whenever I get a few books I really want to talk about or books that publishers have sent my little man that we enjoy reading together. ... But here is a peek into my 3 year old's reading pile! In our reading pile this week we have a ton of llama books, a twist on Goldilocks, a Mo Willems favorite, and a new read from Simon and Schuster. Preschooler's Take: This is my favorite. I love when Mommy makes all the different voices. I like when they eat chocolate pudding- I like chocolate pudding too! Can we go read the dinosaur book now? 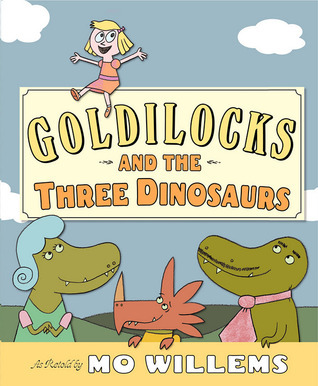 Mommy's Take: Goldilocks and the Three Dinosaurs is a great example of why we love Mo Willems so much- the humor in this book is as funny to adults as it is to kids! Kids will enjoy the silliness of the book, while parents enjoy the subtle humor of the background captions and jokes blended into the story. This is one of our new favorite books and holds up over 300 readings to an insistent preschooler! Merging expressive cartoon network-esque illustrations with beautiful black and white photographs of Brooklyn, this funny story tells how Trixie and Knuffle Bunny's trip to the laundromat with Dad goes terribly wrong when Trixie realizes some bunny's been left behind...! Her attempts to alert Dad all the way home are unsuccessful, until Mum points out that Knuffle Bunny is missing and the family hotfoot it back to the laundromat. 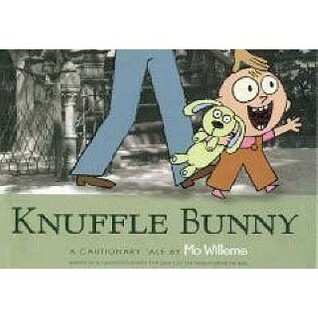 Fortunately, KB is safe, if a little wet..
Preschooler's Take: Knuffle bunny! This book is so funny! When Trixie makes all of her silly sounds it makes me laugh. 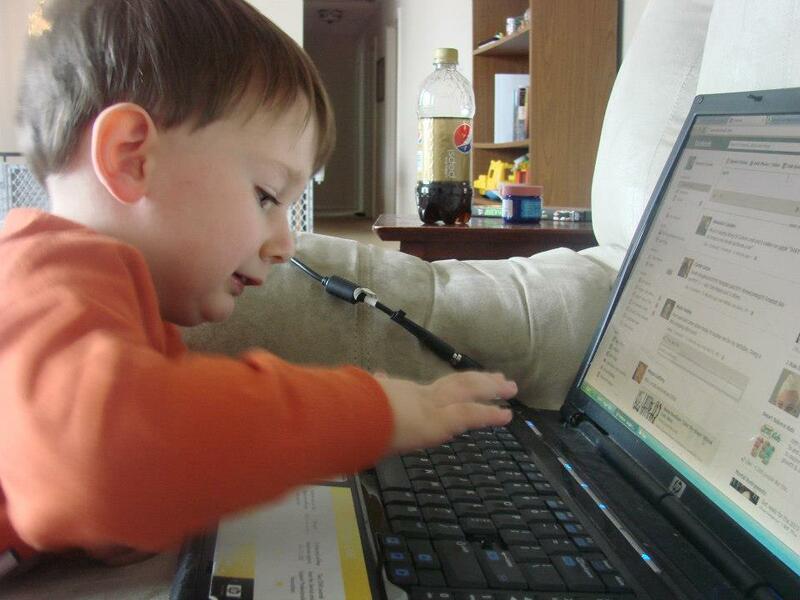 Mommy's Take: With a low word count and mixed media pictures, Knuffle Bunny is a fun read. Kids will love the fun illustrations and silly facial expressions. Parents will appreciate the plight of the parents- both with a lost lovey and what happens when your child is flipping out and you have no idea why. Llama has a sharing drama! Build a tower. Make a moat. Nelly's dolly sails a boat. What can Llama Llama add? Maybe sharing's not so bad. Llama Llama has new neighbors! Nelly Gnu and her mama stop by for a play date, but Llama's not so sure it's time to share all his toys. Maybe just his blocks? It could be fun to make a castle with Nelly . . . But wait--Nelly has Llama's little Fuzzy Llama! 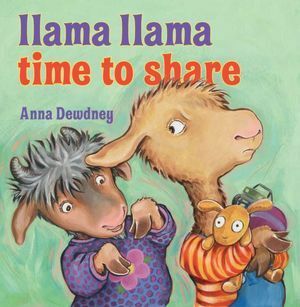 The fun turns to tears when Fuzzy Llama is ripped in two, "all because of Nelly Gnu!" Mama comes to the rescue and fixes Fuzzy, but she makes it clear: "I'll put Fuzzy on the stairs, until you're sure that you can share." Mommy's Take: Llama books are a favorite in our house. If you haven't had a chance to read any of the llama books- do yourself a favor and look at them. I haven't met a preschooler that didn't absolutely love them. Ironically, there have been many catfights over this book in our house.... even though the book is about sharing. What better way for Bear to say thanks, than to have a big dinner with all his friends!Bear has come up with the perfect way to say thanks—a nice big dinner! When Bear decides to throw a feast, his friends show up one by one with different platters of delicious food to share. There’s just one problem: Bear’s cupboards are bare! What is he to do? Mommy's Take: My preschooler got bored with the post and ran away, so here is my take. 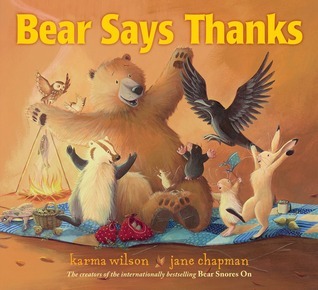 Bear Says Thanks has beautiful illustrations and soft colors. It is very appropriate for young readers, though toddlers may not have the patience to sit through the entire story (since it doesn't have rhyming or repetition.) As a teacher, I was excited to see this story- there aren't many good Thanksgiving books that aren't about a turkey being killed. This is a keeper for the classroom and also for your family.